Young musicians from across the Tristate area are invited to compete for the Nancy F. Walker Memorial Scholarships (total of $50,000) for singers and instrumentalists now being offered by Matinée Musicale Cincinnati. These have been made possible by recent generous donations in memory of Nancy Fuldner Walker and a bequest from the estate of Louise Dieterle Nippert. As an extension of its longtime mission to advance the careers of young instrumentalists and singers, Matinée Musicale invites applications from juniors and seniors in college and high school. Awards will be given to both instrumentalists and singers. Matinée Musicale Cincinnati has presented memorable classical music recitals by rising professional musicians since 1912. Performers who have gone on to illustrious careers range from pianists Nadia Boulanger and Leon Fleisher to violin prodigy Joshua Bell and singers including Beverly Sills and Jamie Barton. Application forms and details are available online: www.matineemusicalecincinnati.org. All applications must be received via email by Friday, March 1, 2019. Auditions will be held on Saturday, April 6, 2019, at St. Paul United Methodist Church (8221 Miami Road, Cincinnati, Ohio 45243). Applicants are expected to perform 8-10 minutes of memorized music in at least two contrasting classical styles. The top recipients in each category will perform at the Scholarship Winner Recital and Luncheon on Wednesday, May 29, 2019, at the Greenacres Arts Center, 8400 Blome Road, Cincinnati, Ohio 45243. Nancy F. Walker, memorialized by these scholarships, was a musician, music teacher, and strong advocate for all music and arts organizations. She provided able leadership to Matinée Musicale Cincinnati for more than four decades before her death in October 2017. Matinée Musicale Cincinnati is honoring her legacy of support and encouragement of young musicians through these scholarships. For further information: 859-781-0801 or Matineemusicalecincinnati.org. 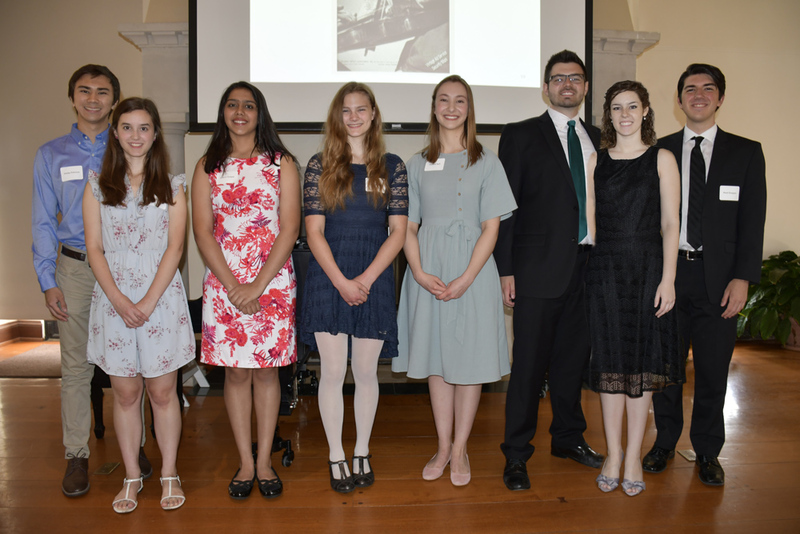 Pictured above are last year’s winners: Phillip Palmore, Natalie Orth, Ishana Galgali, Meagan Hipsky, Claudia Neff, Grant Jackson, Janna Young, Reed Gnepper. Not pictured: Sarah DeMoor, Christina Nam, Lauren Maynus, Zachary Wuorinen.